The Franklin Monroe Jets Youth Volleyball Camp had 11 girls in the fourth through sixth grades learn about volleyball from the Jets’ coaches and high school players. 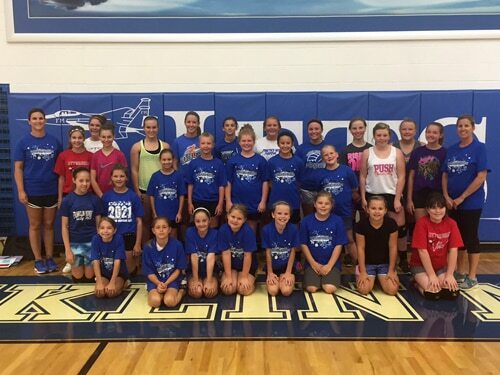 PITSBURG – The Franklin Monroe Jets Youth Volleyball Camp got off to a flying start this past week under the direction of second-year coach Amy Booher. Coach Booher held the camp from 9 to 11 a.m. June 22 thru June 24 at the spacious Hangar. The 11 ranged from fourth grade to sixth grade and all happened to be from the Pitsburg area. The fourth graders consisted of Hallie Aslinger, Lillie Shellabarger, Libby Fox, Paige Drew, Joycelyn Gray and Emma Denlinger. The fifth graders were composed of Layni Norris and Reanna Wright. The sixth graders were Erin Keihl, Olivia Graves and Skylar Baumen. Helpers for Coach Booher were junior varsity coach Angie Filbruns and volunteer assistant varsity coach Kerry Feitshans. Junior high coaches were Brenda Oswalt and Mallory Gray. High School players instructing were Morgan Booher, Carrie Baker, Sydney Bowser, Shania Baker, Audrey Aslinger, Kelly Fourman, Emilee Morris, Hannah Eley, Madison Schaar, Makenzie Kreitzer, Allie Armstrong, Cassidy Spatz, Brigette Filbrun, Kennedy Morris, Sierra Keller, Elisabeth Williams and Peyton Archer. The cost was nominal at $30 per camper, which included instruction from the director herself, the four assistant coaches and the 17 varsity and junior varsity players. The campers received a new volleyball, a FM camp T-shirt and last but not least all the campers and helpers got the ultimate patriotic prize with a red, white and blue Popsicle before the Fourth of July. Skills that the campers worked on were passing, setting, serving, hitting, rotations, rules and most importantly fundamentals. All the games they played were fun, but they had fundamentals thrown in also. The names of the games were Dead Fish, which consisted of serving over the net and the kids got to lie on the floor like dead fish; the communication drill, which involved talking to one another; and the animal’s drill in which the kids were paired with certain animal names and had to respond when their animal’s sound was made. Coach Booher wants to improve on her record from last year, which was 9-13 overall but with a sixth place finish in the Cross County Conference. Coach Booher is very optimistic about the varsity team this year as she has six seniors coming back, including her own daughter, Morgan Booher. Last week Franklin Monroe had its high school and junior high camp run by the Otterbein coaching staff.